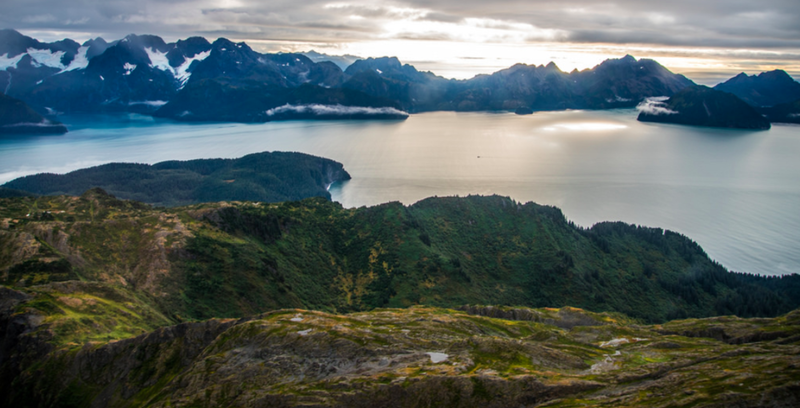 Kenai Fjords is accessed via the city of Seward which was once the start of the Iditarod Trail. (The start of the Iditarod trail has since been moved north to Anchorage due to the lack of snow). The drive down from Anchorage to Seward is scenic as you travel past the Chugach National Forest for nearly the entire 2.5 hour drive. Seward itself is not very large, but if you’ve been following along on my journey you could have maybe guessed that already. Parts of the town operate on a seasonal basis. Many hotels, tours & restaurants are only open during the spring-fall season and close up just before winter arrives as I found out being there the last days of this time of year. Make sure you visit my Flickr PAGE to check out all 102 pics from my trip! Rain was a common occurrence for me on this trip. I think it must have rained every day on me during my entire stay in Alaska. Yet for all that it rained, it wasn’t ever miserable. The on and off again drizzle throughout the day became routine when my only option to explore was to acclimate to the elements. I was told by someone I met out there that the rain helps keep the bug activity low and once you learn that Alaska’s state bird is actually the mosquito (Alaska jokes - it is really the willow ptarmigan) I wasn’t going to complain about that. You may even find the cool moisture refreshing as you hike. 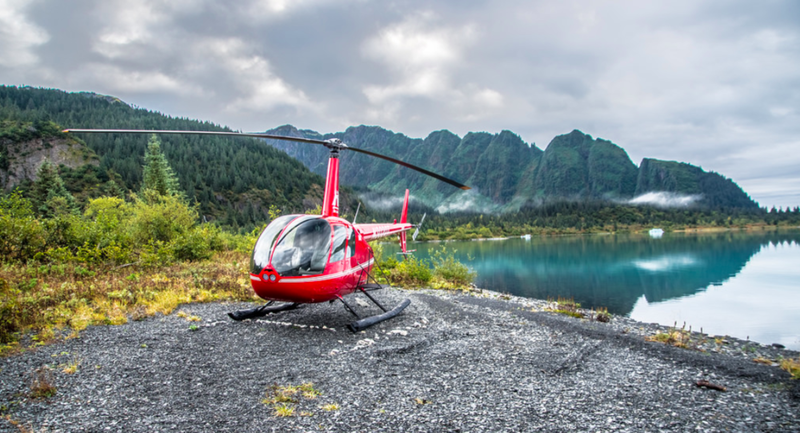 There are a lot of ways to explore Kenai Fjords. I did a little bit by land, air & sea. The park itself only has one very short road that leads to a couple trailheads and ends at the visitors center and the base of Exit Glacier. Helicopter Ride - This was my first time in a helicopter. Due to the price of the helicopter rides I almost did not try this, but I am so glad I did. I took a tour with Marathon Helicopters who did an absolutely amazing job. They were extremely accommodating to the weather conditions and didn’t make us lock into any reservations. My schedule was flexible and they worked with us to find an appropriate time for visibility and fair weather conditions. Very courteous & professional company! My flight consisted of just the pilot, myself & my friend. Our trip was just a short 30 minute flight with a brief landing at a glacier lagoon. I was afraid there was no way we could see very much in just 30 minutes, but I was wrong! Within the very first moments after take off we had flown over the city of Seward and were into the park flying above cascading waterfalls and right up to the mouths of an ice cave. We landed on the beach of Bear Glacier Lagoon where we were able to get out for a short time and enjoy the views. Afterwards we took off again flying parallel along a Bear Glacier’s wall of ice feeding the lagoon, then just above the glacier giving some incredible views into the glacier’s crevasses. Along the way we also had sitings of a bear, moose & multiple mountain goats. For as short as this flight was I feel we saw a lot! The tour company offers some customizable parts of the trip as well as kayaking options in the glacier lagoon. Harding Icefield Trail - Exit Glacier to Harding Snowfield - (8.5 mile round trip - 3,000' ascent) An excellent round trip hike that starts from just below the current toe of Exit Glacier to the 700 square mile Harding Icefield. The Harding Icefield feeds as many as 40 glaciers. The trail climbs above Exit Glacier and gives you some incredible views of the valley behind you and of the glacier below you. Eventually the trail peaks over the ridge line and overlooks the sharp decent to the icefield. Boat Tours - There are a few tours in town that run in the waters of the park. You might check the National Park website to get a list of approved vendors by the park it may change over time. 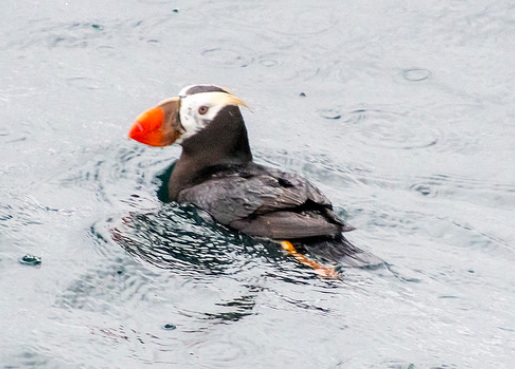 These tours are authorized by the parks to take you out along the steep mountainous shores of Resurrection & Alalik Bays to see wildlife, the Alaskan coast & get up close to a glacier. Weather can play a role in determining the enjoyability and opportunities for what you may see on this tour. We took a tour offered by 'Kenai Fjords Tours’. The crew on our boat was very pleasant and extremely knowledgeable. Our day was rainy, foggy, cold & a bit of a roller coaster at times when sitting near the bow of the boat. According to some staff, this wasn’t even a rough day as the water swells can be much greater at times. There were a few people regurgitating their lunches overboard. If you haven’t seen a glacier up close this is a nice opportunity to witness blue ice and see a glacier calving into the bay. Some tour trips & lengths vary based upon the time of season. On our trip included some unclose time at Aliak Glacier, cruising around the shores and sea stacks of Resurrection Bay and wildlife viewings of some killer whales (orca) swim underneath our vessel, steller sea lions, harbor seals & puffins. There aren’t a lot of hiking trails directly in the park so this trail is popular. Don’t expect too much exclusivity, but the views are pretty incredible as you quickly ascend the mountain side towards the top of the glacier. The toe of the glacier area seems to be the most crowded spot where the occasional tour bus lets out. As you climb higher you will get away from the larger groups of people. The view continuously gets better as you climb and even if you don’t make it to the icefield the views along the way are worth the effort. The weather held out just enough for me this day to get to the top as the clouds engulfed us and our views of the icefield. While I did manage to make it to the top my visibility became extremely limited, temperatures dropped to around freezing and it began to rain. Amazing views, but I wish the clouds would have held off for just a little longer on my hike! Looking up at the mountain of ice and looking down from above into the crevasses gives you two totally different perspectives of the ice formation and how deep it really is. Bears are a common site from along the trail so keep vigilant, but the trail is fairly well populated with people as well. (Special thanks to our amazing boat tour guide who took us out on a hike here). From Anchorage to Seward you travel through the Chugach National Forest. About an hour north of Seward is the Russian River campground area and the Russian River Trail. Here is where we got lucky and saw at least three brown bears fishing salmon out of the river. A truly impressive & authentic Alaskan experience! I'll be back again soon with more exploration from the 4th and final National Park I have been to in Alaska! Let me know any questions in the comments about Alaskan travel and sign up in the footer for great prizes and follow along on my Flickr page HERE for all of my future adventures!